For Facebook and marketers alike, the announcement is what ProPublica reporter Julia Angwin called “a big deal.” Here’s what’s going on — and why it matters. Prior to these recent changes, advertisers on Facebook had a few primary sources of user data that they could use for targeting purposes, including data that Facebook itself has from what users provide on their profiles, as well as their activity on the network. It’s not entirely unlike what’s available in your downloadable Facebook data archive file, which I wrote about here. That data could be used in combination with other sources of information that the advertiser might have on its own, like email contacts or survey responses. 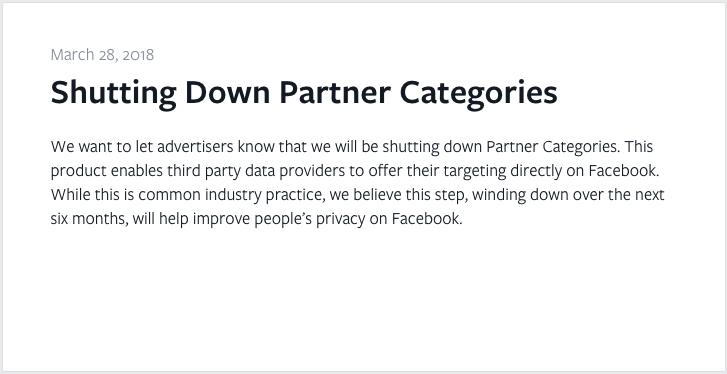 Finally, there are the third-party data providers, which are the ones Facebook has severed ties with. These companies possess and provide advertisers with data that are often based on non-social-media activities, like shopping history and income — which is part of what Angwin and her team discovered when ProPublica started investigating the breadth of Facebook user data in 2016. The data from these providers are often synthesized in tandem with information that Facebook has from user profiles, helping to match (or target) promoted content to the most relevant audiences. It’s a powerful combination that could be at least partially responsible for Facebook’s growth as a valuable advertising platform — to the point where 98% of its 2017 global revenue was rooted in advertising. It’s no secret, then, that providing these services is a source of revenue for the data providers, too. 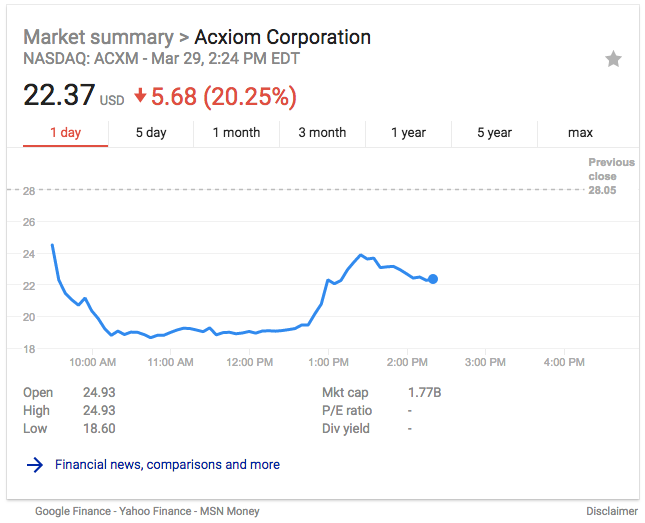 According to the Wall Street Journal, Acxiom stands to lose $25 million in fiscal 2019 revenue and profit. And while it seems possible for advertisers to still independently enlist these third-party services, a barrier to access is now in place that was previously removed by direct data availability through Facebook. But how much do advertisers stand to lose from these changes? Well, that depends who you ask. When I first tweeted this news after it broke last night, one of my followers suggested that he’d be losing a major source of information for his work. The extent of the setback to marketers and advertisers also depends on the industry — those who depend on a consumer’s shopping habits and history, for example, could potentially lose out by not having access to detailed, third-party data on it. But keep in mind that Facebook has quite the cache of user data entirely on its own. Remember that downloadable data file I alluded to earlier? Have another look. 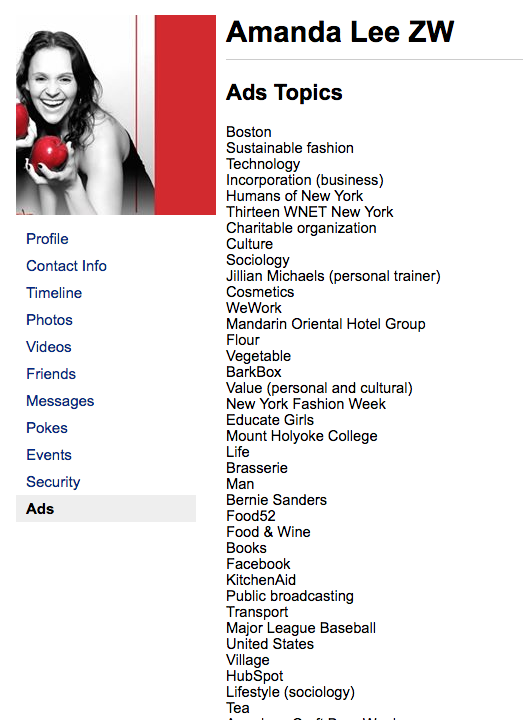 The file shows that Facebook possesses a decent — if not confusing — amount of information on users’ interests and activities. And where that data really comes into play for most advertisers is in its own ad-targeting platform. Here’s the thing about the user data in Facebook’s possession (the kind that’s used within its own targeting tools): Advertisers aren’t supposed to have direct access to that information in a way that attaches it to specific people. Instead, it’s supposed to be anonymous and general enough that, for example, an advertiser can target Boston-based women in a certain age bracket who are interested in KitchenAid and BarkBox — but not be able to do is know who, specifically, the women are within that targeted audience. And as Google Product Manager Michael Sayman explains, that’s part of what helps Facebook earn such revenue through advertising: by requiring advertisers to use that platform to reach the right audience by leveraging a targeting system based on Facebook’s (proprietary) user data. If Facebook didn’t keep that information to itself, he explains, advertisers wouldn’t need the platform to accomplish their goals. What’s considered identifiable user data? Your name, pictures, videos, address, phone numbers, emails, any contact info, or any identifiable info of their friends. For FB to make the most amount of money, it is in FB’s best interest to NOT sell any of this data to advertisers. But that’s also part of what got Facebook into this situation in the first place. Previous policies allowed third parties like app developers and academics to access user data for things like research purposes — but prohibited them from transferring that information to others. But when it came to light that one app developer may have violated that policy by supplementing data analytics firm Cambridge Analytica with that information, the social network began making changes to the availability of and policy clarity around user data. But it may not be entirely in response to this particular situation. On May 25, which is less than two months away, the General Data Privacy Regulation (GDPR) comes into force and will impact the way organizations obtain, store, manage or process the personal data of EU citizens — which some believe is also behind these recent policy changes and notifications. But all things considered, this is likely not the last policy change expected from Facebook. And as the story continues to unfold, I’ll be monitoring it. Questions? Feel free to weigh in on Twitter.